I qualified as a vet from Edinburgh University. I studied at Options for Animals with the original teaching faculty under Sharon Willoughby and qualified in 2000. I have been working in my animal chiropractic practice since then. 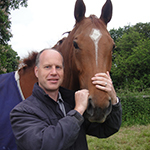 I am particularly interested in equine musculoskeletal practice and have now given up veterinary clinical work completely to focus on animal chiropractic exclusively.